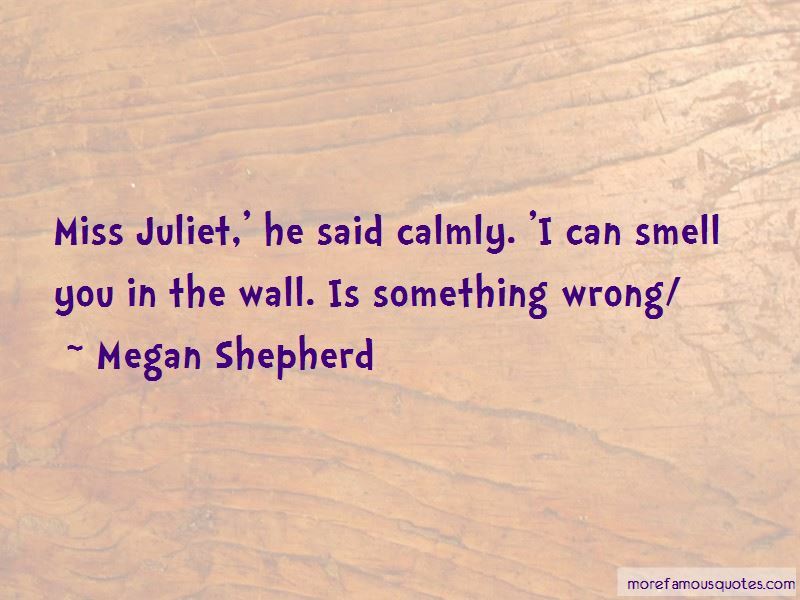 Enjoy reading and share 39 famous quotes about I Can Smell You with everyone. “No, little one, George's ghost won't come back. Human beings don't have souls. No soul, no ghost. Simple." "How can you say that?" protested Mopple. "We don't know whether humans have souls or not." "Every lamb knows that your soul is in your sense of smell. And human beings don't have very good noses." Maude herself had an excellent sense of smell, and often thought about the problem of souls and noses. “You think you cannot live anymore. You think that the light of your soul has been put out and that you will stay in the dark forever. But when you are engulfed by such solid darkness, when you have both eyes closed to the world, a third eye opens in your heart. And only then do you come to realize that eyesight conflicts with inner knowledge. No eye sees so clear and sharp as the eye of love. After grief comes another season, another valley, another you. And the lover who is nowhere to be found, you start to see everywhere. “Okay," she drew out. "Let me rephrase that. Did you sleep with Sage yet?" She smacked my leg and exclaimed, "I knew it! I could smell it on you." "You can smell it on me?" “I can smell you, Ms. Lane," he said, even more softly. "The only blood on you is from your veins, not your womb." “Lure him out. Send in a 'customer' with a message from me needing to meet him. I'm not the kind of person he can ignore-well, that he used to not-never mind. Once he's out, we can get him to a place we choose." I nodded. "I can do that." "No," said Dimitri. "You can't." "Why not?" I asked, wondering if he thought it was too dangerous for me. "Because they'll know you're a dhampir the instant they see you. They'll probably smell it first. No Strigoi would have a dhampir working for him-only humans." There was an uncomfortable silence in the car. “Okay." I bounced down the stairs. "I'm decent." He was waiting at the foot of the stairs, closer than I'd thought, and I bounded right into him. He steadied me, holding me a careful distance away for a few seconds before suddenly pulling me closer. "Wrong again," he murmured in my ear. "You are utterly indecent - no one should look so tempting, it's not fair." "Tempting how?" I asked. "I can change ... "
He sighed, shaking his head. "You are so absurd." He pressed his cool lips delicately to my forehead, and the room spun. The smell of his breath made it impossible to think. "Shall I explain how you are tempting me?" he said. It was clearly a rhetorical question. His fingers traced slowly down my spine, his breath coming more quickly against my skin. My hands were limp on his chest, and I felt ligtheaded again. He tilted his head slowly and touched his cool lips to mine for the second time, very carefully, parting them slightly. "What's the matter? You afraid you'd bite your skinny little girlfriend?" Jester laughed. "She's already someone else's, you know. I can smell the bite on her. He's marked her." “As I got closer to the fence, I held my shirt over my nose to block the smell. One stallion waded through the muck and whinnied angrily at me. He bared his teeth, which were pointed like a bear's. I tried to talk to him in my mind. I can do that with most horses. Hi, I told him. I'm going to clean your stables. Won't that be great? Yes! The horse said. Come inside! Eat you! Tasty half-blood! But I'm Poseidon's son, I protested. He created horses. Usually this gets me VIP treatment in the equestrian world, not this time. Yes! The horse agreed enthusiastically. Poseidon can come in, too! We will eat you both! Seafood! “Y'all might as well come on out," I said. "I know you're there. I can smell you." "Smell me? But I just took a shower this morning!" an indignant voice drifted out of the shadows. There was a loud sound, like someone was getting smacked upside the head. Then another voice let out a low mutter. Want to see more pictures of I Can Smell You quotes? Click on image of I Can Smell You quotes to view full size.